The Spanish word acequia (and Catalan séquia) comes from Classical Arabic "as-sāqiya", which has the double entendre of "the water conduit" or "one that bears water" and the "barmaid". The Arabs brought the technology to Iberia during their occupation of the Iberian peninsula. The technology was adopted later by the Spanish and Portuguese (levadas on Madeira Island), utilized throughout their conquered lands, except in e.g. Mendoza, Argentina where acequias today run along both sides of all city streets but originally were dug all around by the indigenous Huarpes long before the arrival of the Spanish. 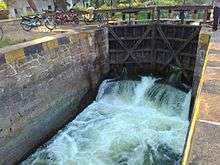 Known among water users simply as the Acequia, various legal entities embody the community associations, or acequia associations, that govern members' water usage, depending on local precedents and traditions. 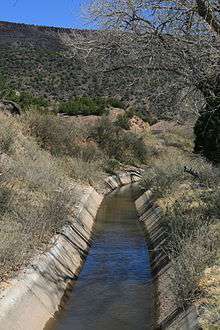 An acequia organization often must include commissioners and a majordomo who administers usage of water from a ditch, regulating which holders of water rights can release water to their fields on which days. In New Mexico, by state statute, acequias as registered bodies must have three commissioners and a mayordomo (see Rivera, 1998, pp. 59-60). Irrigation and conservation districts typically have their own version of mayordomos, usually referred to as "ditch riders" by members of the districts. Thomas Glick. Irrigation and Society in Medieval Valencia. Cambridge, Mass: Harvard University Press, 1970. Spanish version: Regadío y sociedad en la Valencia medieval. Del Cenia al Segura. Valencia, 1988.